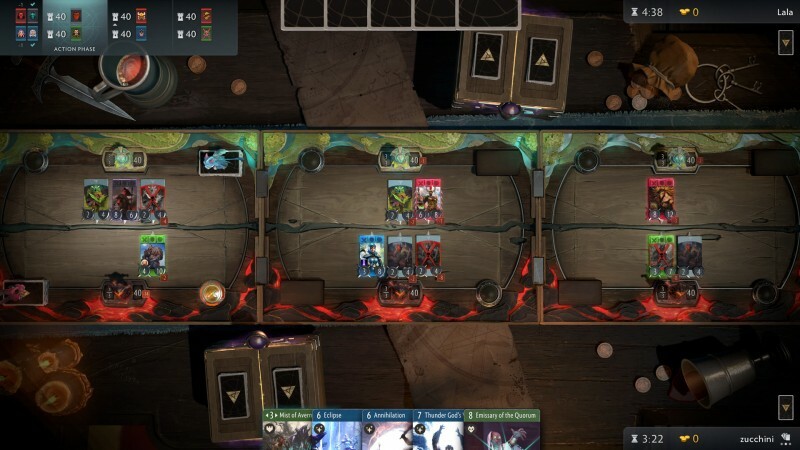 I had plenty of questions going into my demo for Valve's upcoming card game Artifact. How could the three lane structure be anything but a mess? It's true, you essentially are playing 3 different games at the same time - and you need to "win" two of them. After several games (I went back to the booth several times because frankly, I'm already hooked), any concerns I had about the game vanished. Somehow, Valve has crafted a simple to understand but insanely complex strategy game that rewards careful planning and execution. The game uses Dota 2 lore and characters as inspiration, but outside of that and the fact that it has three lanes, there's no need to have any knowledge of the MOBA. This is a card/strategy title at its core, and I'm almost certain that it has much more to offer Magic: The Gathering, Hearthstone, and Gwent players than the core Dota audience. Conceptually, you play five heroes in each of the three lanes. Heroes often have passive and active abilities that key into their Dota counterparts, like Earthshaker stunning enemies in his lane, Crystal Maiden providing additional resources, or Lycan buffing up his allies. Some, like Axe, have no abilities at all and are just "stat sticks" with high numbers. The goal is to defeat the enemy tower in 2 lanes, or take down an ancient (ancients have truckloads of hit points and only appear after a lane's tower is defeated), which is significantly more challenging and requires absurd lane dominance or a strategy designed to focus on that goal alone. Gameplay took some getting used to. There are an absurd amount of moving parts, but it's a refreshing and delicious complexity that lets you plan moves far in advance, make interesting decisions about how to allocate resources, and consider each card played, in what order, and when. My first few games took quite a while in comparison to other digital card games, but the game time was cut down significantly by my third game - around 20 minutes. The item deck is just as important as your hand, as is knowing when to spend your money. Gold is a resource separate from mana and can be hoarded to purchase extremely powerful items that can swing lanes and even games, but saving coins in your piggy bank may cause you to be overwhelmed and outmatched, leading to an early defeat. Again, it seems like a deluge of different things to keep track of, and it can be intimidating at first, but it flows smoothly after a few rounds. As games play out, you must constantly analyze the game state and make decisions accordingly. Is it worth pulling out of the first lane completely because your opponent has invested a ton of resources there and focus on smashing the other two? Should you go all in on one lane and attempt to defeat the ancient? The correct decision may shift rapidly as more heroes and items land on the table. Some cards can be played from one lane into different lanes, adding yet another layer of strategy and texture. Let's say you have taken over a lane and the opponent has (wisely) started focusing efforts elswhere. 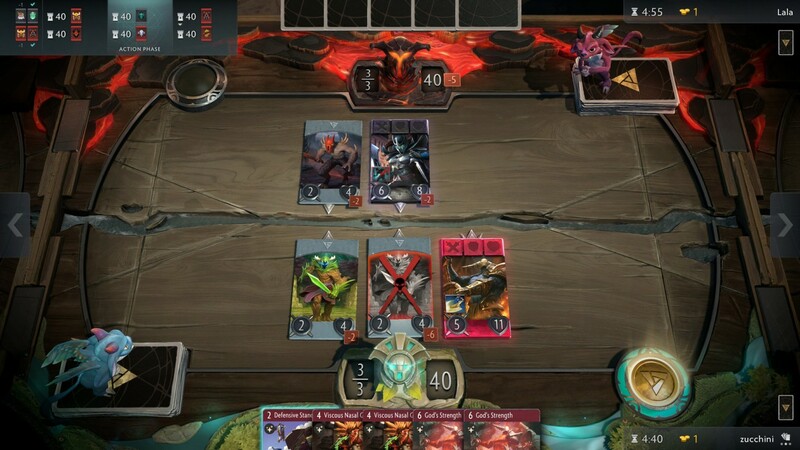 You can still get value out of that lane by using your heroes to play cards into other lanes, like a blue effect that does damage to enemies in the lane every turn, or spells and abilities that let you draw cards - your hand is shared between all lanes, so you can turn the lane you're already winning into a resource station to help win fights in the others. I was concerned the game would be slow (Matches are definitely longer than other card games) but they don't feel slow at all once you have two players with some idea of what they are doing. It's a fast back and forth, with major decisions happening at every turn. The three lane structure somehow works, and offers compelling strategy decisions. The characters and cards are fun and powerful, and even the 4 pre-constructed decks I had a chance to play with gave a great taste of potential deckbuilding considerations once players get to build on their own. From econ ramp to board control to big big buffs, there's going to be a strategy for everyone. I can't wait to play more Artifact, and with the beta coming in October, I thankfully won't have to wait too long.